Louis Napoléon Bonaparte (born Luigi Buonaparte; 2 September 1778 – 25 July 1846) was a younger brother of Napoleon I, Emperor of the French. He was a monarch in his own right from 1806 to 1810, ruling over the Kingdom of Holland (a French client state roughly corresponding to the current Netherlands). In that capacity he was known as Louis I (Dutch: Lodewijk I; Dutch pronunciation: [ˈloːdəʋɛik]). Louis was the fifth surviving child and fourth surviving son of Carlo Buonaparte and Letizia Ramolino, out of eight children who lived past infancy. He and his siblings were all born on Corsica, which had been conquered by France less than a decade before his birth. Louis followed his older brothers into the French Army, where he benefited from Napoleon's patronage. In 1802, he married his step-niece Hortense de Beauharnais, the daughter of Empress Joséphine (Napoleon's wife). In 1806, Napoleon established the Kingdom of Holland in place of the Batavian Republic, appointing Louis as the new king. Napoleon had intended for Holland to be little more than a puppet state, but Louis was determined to be as independent as possible, and in fact became quite popular amongst his new people. Growing tired of his brother's wilfulness, Napoleon annexed Holland into the French Empire in 1810. Louis fled into exile in Austria, where he spent the rest of his life. His son Louis-Napoléon established the Second French Empire, taking the throne as Napoleon III. Louis supposedly suffered from periods of mental illness. These periods of depression or mental instability (records fail to distinguish) would plague Louis until his death. 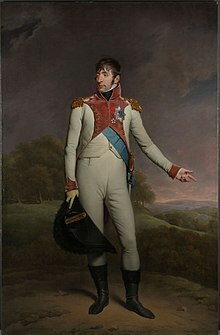 Feeling that the Batavian Republic was too independent for his liking, Napoleon replaced it with the Kingdom of Holland on 5 June 1806, and placed Louis on the throne. Napoleon had intended for his younger brother to be little more than a French prefect of Holland. However, Louis had his own mind, and tried to be a responsible and independent ruler. In an effort to endear himself to his adopted country, he tried to learn the Dutch language; he called himself Lodewijk I (adopting the Dutch form of his name) and declared himself Dutch rather than French. Allegedly, his Dutch was initially so poor that he told the people he was the Konijn van 'Olland ("Rabbit of 'Olland"), rather than Koning van Holland ("King of Holland"). However, his sincere effort to learn Dutch earned him some respect from his subjects. Louis could never settle on the location for his capital city while he was in Holland. He changed capitals over a dozen times, trying Amsterdam, The Hague, Utrecht, and other places. On one occasion, after visiting the home of a wealthy Dutch merchant, he liked the place so much that he had the owner evicted so he could take up residence there. Then, Louis moved again after seven weeks. His constant moving kept the court in upheaval since they had to follow him everywhere. The European diplomatic corps went so far as to petition Bonaparte to remain in one place so they could keep up with him. This restlessness was later attributed to his alleged "lunacy". Hortense bore Louis's sons Napoléon Charles Bonaparte and Napoléon Louis Bonaparte in Paris, while Louis was in Holland. In 1806, Louis called for his son to be sent to him in Holland, but he was again refused by Hortense, who believed that her son would never be returned to France. When Louis appealed to his brother Napoleon for help, Napoleon sided with Hortense. Napoleon kept the boy in his own court, and he even had him named the heir to the French throne prior to the birth of his own son. ^ Farquhar, Michael (2001). A Treasure of Royal Scandals, p.163. Penguin Books, New York. ISBN 0-7394-2025-9. ^ Geer, Walter (1929). Napoleon and His Family: Moscow-Saint Helena, 1813–1821. Allen & Unwin. p. 7. ^ Foissy, M. (1830). La famille Bonaparte depuis 1264 (in French). Paris: Vergne. p. 130. ^ Bonaparte, Louis (1829). Reponse à sir Walter Scott, sur son histoire de Napoleon (in French). Paris: C.J. Trouve. p. 1.